The IOC is chairing the important Working Session on the Climate of Oceans and Coasts. UNESCO and its IOC are members of the International Organizing Committee of World Climate Conference-3 (WCC-3), which has its theme “Climate prediction and information for decision-making: focusing on scientific advances in seasonal to interannual timescales, taking into account multi-decadal prediction”. WCC-3 follows the first two World Climate Conferences; WCC-1 led to the Intergovernmental Panel on Climate Change (IPCC), the World Climate Programme and the World Climate Research Programme, while WCC-2 led to the UN Framework Convention on Climate Change (UNFCCC) and the Global Climate Observing System. UNESCO has long been involved in supporting all of these. WCC-3 is the largest gathering of scientists interested in climate change prior to UNFCCC’s COP 15 to be held December 2009. UNESCO’s Director-General will speak at the High-level Segment of the Programme and UNESCO will also make a formal statement in the Opening Session. The IOC is chairing the important Working Session on the Climate of Oceans and Coasts. The user-focused Session will address the special vulnerability of coastal regions to climate change and risk, by reviewing the coastal ocean information needs, and will discuss the capabilities of global ocean programmes to inform climate services, by making recommendations on how the ocean observing systems ought to be enhanced to best contribute to the urgent questions posed by science and policy. WCC-3 will propose a strategy for developing climate services through establishing a Global Framework for Climate Services. One component of the Framework will be a new World Climate Services System (WCSS), which would be expected to develop and deliver sector- and user-targeted services, build capacity in developing countries and develop policies to support application of climate services for economic and societal benefit. It is on this outcome that UNESCO aims to focus. To this end, UNESCO has organized two fora and a side event which address aspects of the WCSS as well as the Framework, in addition to the working session previously mentioned. UNESCO’s Natural Sciences Sector has organized, in collaboration with the International START Secretariat, a Capacity-building, Education and Training Forum. This Forum aims to elucidate the scope of a WCSS, lessons learned from previous and current efforts at developing capacity in meteorology, climate science, disaster risk reduction and for policy-makers and user-groups of climate information, and action points going forward. UNESCO’s Division for Gender Equality in the Bureau of Strategic Planning has organized, in collaboration with partners FAO, GGCA, IUCN, UNDP, UNEP and WMO, a Forum on Gender and Climate Change. In order to be effective and meaningful, the new Framework needs to be closely linked to the needs and expectations of communities and societies at every level. This implies the need to understand the gender dimensions of climate change. The Forum will explore linkages between gender and climate issues, particularly in relation to the role of women as effective agents of change, and enhancing women’s capacities to address climate change. Finally, the Water Sciences Division in the Natural Sciences Sector has organized a side event, Groundwater and Climate. It will contribute directly to the conference sub-themes of Climate impacts and adaptive strategies, and Advancing climate prediction and information science. Groundwater is not well represented in global climate models due to the difficulty of measurements and scarcity of data. Yet groundwater will play a major role in society’s ability to adapt to future change. It is imperative that dialogue between groundwater and climate scientists be improved at the global level. PAYSON, Utah, Aug. 31 (UPI) — Two air tankers, a helicopter and 15 engines were fighting a 500-acre wildfire in the Tonto National Forest near Payson, Ariz., authorities said Monday. Campers and residents of two subdivisions north of Payson were evacuated after the fire was reported spreading Sunday, forest information officer Tammy Pike said. None of the fire was contained and the cause was unknown, she told the Arizona Republic in a story published Monday. NEW HARMONY, Utah, Aug. 30 (UPI) — Nearly 150 residents of New Harmony, Utah, left their homes Sunday in the face of a 10,000-acre wildfire, authorities say. The Salt Lake Tribune said Washington County Search and Rescue team members prompted a voluntary evacuation in the Utah town Sunday as aerial crews attempted to contain the Mill Flat Fire through the use of fire retardant. Sheriff Kirk Smith said local residents are being informed that firefighters will better be able to protect New Harmony homes if they take part in the voluntary evacuation. The Mill Flat Fire has already consumed three homes and damaged three others, Washington County emergency services director Dean Cox said. “The siding just melted off of one of the damaged houses,” Cox told the Tribune. No injuries have been reported to date. Lighting started the wildfire on July 25, but the blaze was strengthened Saturday by strong winds in the New Harmony area. The Tribune said firefighters are focusing their efforts on preventing the wildfire, which has also benefitted from hot dry conditions in the area, from damaging New Harmony properties. LOS ANGELES, Aug. 29 (UPI) — Los Angeles residents were warned to avoid outdoor activities as thick smoke from four wildfires blanketed the region, authorities said. The fires had burned nearly 10,000 acres and forced the evacuation of thousands as more than 2,700 firefighters and numerous air tankers and helicopters sought to keep the flames from sweeping up hillsides, the Los Angeles Times reported Saturday. The fires were skipping through steep, brush-filled canyons east and north of Los Angeles, the worst of the fires being the so-called Station Fire on the slopes of La Canada Flintridge, the Times reported. Winds were calm, but air temperatures remained above 100 degrees, which trapped foul smoke in the San Gabriel and San Fernando valleys, health officials said. The triple-digit temperatures were expected to last through Sunday with the Station Fire just 5 percent contained as of late Friday. * Public warned about wildfires in B.C. SALT LAKE CITY, Aug. 31 (UPI) — A fast-moving fire burned nearly 9,000 acres overnight in Utah’s Pine Valley Mountain Wilderness Area, authorities said. The fire, sparked by lightning July 25, had burned through 1,200 acres of mostly dead vegetation when it flared Saturday, the Salt Lake Tribune reported Monday. “It came down (the) canyon like a fireball,” New Harmony City Councilman Dellas Imlay told the Tribune. As of late Sunday, at least three homes had been destroyed and about 170 residents evacuated amid forecasts of high winds, hot temperatures and low humidity, the Tribune said. “The siding just melted off one of the damaged houses,” said Dean Cox, Washington County emergency services director. Smoke from the Mill Flat Fire could be seen throughout southwestern Utah, the Tribune reported. ATHENS, Greece, Aug. 23 (UPI) — Wildfires raging through Greece prompted rescue personnel Sunday to seek the evacuations of 20,000 people living in suburban Athens, officials said. Panagiotis Vorias, mayor of the Athens suburb Agios Stefanos, said police there have been asked to help evacuate the city’s 20,000 residents as an uncontrolled fire burned on the northeastern edges of the Greek capital, CNN reported. “They took the move as a precautionary measure because the fire there is raging out of control,” Vorias told CNN. Citizen Protection Agency Chief Margaritas Mouzas said at least 1,000 had already fled their homes in Agios Stefanos, but about 10,000 people did not want to leave. Officials said more than 600 firefighters fighting the wildfires cleared out two children’s hospitals and a senior citizens’ home in suburban Athens, as well as a monastery and some summer camps, CNN said. Aircraft from Italy and France Sunday were to aid Greece in fighting the fires.The brush fires started late Friday in hot, dry weather and spread rapidly. While no casualties had been reported, the fires were the worst since 2007, when nearly 70 people died, a regional Athens governor said. LOS ANGELES, Aug. 31 (UPI) — A wildfire north of Los Angeles doubled in size overnight, consuming structures and threatening homes from Acton to Atladena, California fire officials said. The Station fire, blamed for the deaths of two firefighters, is threatening the Mount Wilson Observatory and its communications towers, the Los Angeles Times reported Monday. The fire raged on up to 85,000 acres overnight and destroyed more than 18 homes in Tugjunga Canyon and an unknown number of homes south of Acton. Evacuations were under way as the blaze pushed forward in three directions, fire officials said. While fire officials told the Times the blaze hasn’t burned to the top of Mount Wilson, they said the area was vulnerable. Firefighters were stationed at the observatory to protect the facility and its equipment from the encroaching flames. Two firefighters were killed Sunday when they drove off the side of a treacherous road in the Mount Gleason area, south of Acton, officials said. More than 12,500 homes were threatened, and 6,600 were under mandatory evacuation orders as of Sunday night, the Times reported. Fire officials said the blaze was about 5 percent contained, KTLA-TV, Los Angeles, reported. Officials said full containment may not be reached until Sept. 8. Meanwhile, state fire officials said a wildfire in the Gold Country town of Auburn scorched scores of businesses and homes Sunday evening, the San Francisco Chronicle said. Firefighters evacuated residents along several roads leading to Auburn, and sent an automated call to all homes within 7 miles of the blaze, requesting voluntary evacuations, the San Francisco newspaper said. Wildfires are a growing natural hazard in most regions of the United States, posing a threat to life and property, particularly where native ecosystems meet developed areas. NOAA’s National Weather Service provides daily fire weather forecasts, fire weather warning products, and forecasts designed to assist wildland Fire Agencies’ assessment of fire danger every day of the year. Most NWS Weather Forecast Offices provide fire forecasts twice a day and provide warnings in close partnership with local, state and Federal fire control agencies. Every year, fire weather forecasting experts provide over 8,000 Red Flag Warnings and Fire Weather Watches for protection of the public and safety of fire fighters on the ground. Also, Weather Forecast Staff provide vital, site-specific spot forecasts for wildfire, prescribed fire projects, all-hazards incidents, marine incidents and search and rescue. Spot forecast requests have been increasing tremendously, with the NWS now providing over 19,000 Spots every year. The National Weather Service has a cadre of around 70 meteorologist that are specially trained to go to wildfires and other incidents and give weather briefings and forecasts to the incident responders and command staff. The meteorologist’s forecasts ensure the safety of operations and allow responders to plan operations taking into account one of the most changeable aspects of an incident, the weather. This group, known as the Incident Meteorologists (IMETs), has been protecting the nation’s incident responders for nearly 90 years. The next G20 summit is due to take place in Pittsburgh, Pennsylvania on September 24–25, 2009. Announced shortly after the April 2009 G-20 London summit, U.S. President Barack Obama volunteered to host this summit, initially planning to hold it in New York City and coordinating it with the opening of the United Nations General Assembly. However, due to coordination issues, on May 28, 2009, the Obama Administration announced a change of venue to Pittsburgh in order to highlight the city’s economic recovery following the collapse of its manufacturing sector in the latter half of the 20th century. In response to the Global credit crisis, a G20 summit in one year was proposed shortly after the London summit in April 2009. The second G20 2009 summit will hopefully evaluate the measures taken in April 2009 in London and implement new policies which will stimulate the global economy. Amongst the issues to be discussed is a proposal to radically reform the International Monetary Fund. French President Nicholas Sarkozy also suggested that there would be an evaluation of measures already taken. For the labor union vitiation procedure, see NLRB election procedures#Decertification elections. Desertification is the degradation of land in arid and dry sub-humid areas, resulting primarily from man-made activities and influenced by climatic variations. It is principally caused by overgrazing, overdrafting of groundwater and diversion of water from rivers for human consumption and industrial use, all of these processes fundamentally driven by overpopulation. A major impact of desertification is biodiversity loss and loss of productive capacity, for example, by transition from land dominated by shrublands to non-native grasslands. In the semi-arid regions of southern California, many coastal sage scrub and chaparral ecosystems have been replaced by non-native, invasive grasses due to the shortening of fire return intervals. This can create a monoculture of annual grass that cannot support the wide range of animals once found in the original ecosystem. In Madagascar‘s central highland plateau, 10% of the entire country has been lost to desertification due to slash and burn agriculture by indigenous peoples. In Africa, if current trends of soil degradation continue, the continent will be able to feed only 25% of its population by 2025, according to UNU‘s Ghana-based Institute for Natural Resources in Africa. Globally, desertification claims a Nebraska-sized area of productive capacity each year. Sand dunes advancing on Nouakchott, the capital of Mauritania. Desertification is induced by several factors, primarily anthropogenic causes, which began in the Holocene era and continue at the highest pace today. The primary reasons for desertification are overgrazing, over-cultivation, increased fire frequency, water impoundment, deforestation, overdrafting of groundwater, increased soil salinity, and global climate change. Deserts may be separated from surrounding, less arid areas by mountains and other contrasting landforms that reflect fundamental structural differences in the terrain. In other areas, desert fringes form a gradual transition from a dry to a more humid environment, making it more subtle to determine the desert border. These transition zones can have fragile, delicately balanced ecosystems. Desert fringes often are a mosaic of microclimates. Small pieces of wood support vegetation that picks up heat from the hot winds and protects the land from the prevailing winds. After rainfall the vegetated areas are distinctly cooler than the surroundings. In these marginal areas activity centres may stress the ecosystem beyond its tolerance limit, resulting in degradation of the land. By pounding the soil with their hooves, livestock compact the substrate, increase the proportion of fine material, and reduce the percolation rate of the soil, thus encouraging erosion by wind and water. Grazing and collection of firewood reduce or eliminate plants that bind the soil and prevent erosion. All these come about due to the trend towards settling in one area instead of a nomadic culture. Sand dunes can encroach on human habitats. Sand dunes move through a few different means, all of them assisted by wind. One way that dunes can move is through saltation, where sand particles skip along the ground like a rock thrown across a pond might skip across the water’s surface. When these skipping particles land, they may knock into other particles and cause them to skip as well. With slightly stronger winds, particles collide in mid-air, causing sheet flows. In a major dust storm, dunes may move tens of meters through such sheet flows. And like snow, sand avalanches, falling down the steep slopes of the dunes that face away from the winds, also moving the dunes forward. It is a common misconception that droughts by themselves cause desertification. While drought is a contributing factor, the root causes are all related to man’s overexploitation of the environment. Droughts are common in arid and semiarid lands, and well-managed lands can recover from drought when the rains return. Continued land abuse during droughts, however, increases land degradation. Increased population and livestock pressure on marginal lands has accelerated desertification. In some areas, nomads moving to less arid areas disrupt the local ecosystem and increase the rate of erosion of the land. Nomads typically try to escape the desert, but because of their land-use practices, they are bringing the desert with them. Some arid and semi-arid lands can support crops, but additional pressure from greater populations or decreases in rainfall can lead to the few plants present disappearing. The soil becomes exposed to wind, causing soil particles to be deposited elsewhere. The top layer becomes eroded. With the removal of shade, rates of evaporation increase and salts become drawn up to the surface. This increases soil salinity which inhibits plant growth. The loss of plants causes less moisture to be retained in the area, which may change the climate pattern leading to lower rainfall. This degradation of formerly productive land is a complex process. It involves multiple causes, and it proceeds at varying rates in different climates. Desertification may intensify a general climatic trend toward greater aridity, or it may initiate a change in local climate. Desertification does not occur in linear, easily mappable patterns. Deserts advance erratically, forming patches on their borders. Areas far from natural deserts can degrade quickly to barren soil, rock, or sand through poor land management. The presence of a nearby desert has no direct relationship to desertification. Unfortunately, an area undergoing desertification is brought to public attention only after the process is well under way. Often little data are available to indicate the previous state of the ecosystem or the rate of degradation. Desertification is both an environmental and developmental problem. It affects local environments and populations’ ways of life. Its effects, however, have more global ramifications concerning biodiversity, climatic change and water resources. The degradation of terrain is directly linked to human activity and constitutes both one of the consequences of poor development and a major obstacle to the sustainable development of dryland zones. Combating desertification is complex and difficult, usually impossible without alteration of land management practises that led to the desertification. Over-exploitation of the land and climate variations can have identical impacts and be connected in feedbacks, which makes it very difficult to choose the right mitigation strategy. Investigating the historic desertification plays a special role since it allows better distinguishing of human and natural factors. In this context, recent research about historic desertification in Jordan questions the dominant role of man. It seems possible that current measures like reforestation projects cannot achieve their goals if global warming continues. Forests may die when it gets drier, and more frequent extreme events as testified in sediments from earlier periods could become a threat for agriculture, water supply, and infrastructure. Desertification is a historic phenomenon; the world’s great deserts were formed by natural processes interacting over long intervals of time. During most of these times, deserts have grown and shrunk independent of human activities. Paleodeserts are large sand seas now inactive because they are stabilized by vegetation, some extending beyond the present margins of core deserts, such as the Sahara. Many deserts in western Asia arose because of an overpopulation of prehistoric species and subspecies during the late Cretaceous era. Dated fossil pollen indicates that today’s Sahara desert has been changing between desert and fertile savanna. Studies also show that prehistorically the advance and retreat of deserts tracked yearly rainfall, whereas a pattern of increasing amounts of desert began with human-driven activities of overgrazing and deforestation. A chief difference of prehistoric versus present desertification is the much greater rate of desertification than in prehistoric and geologic time scales, due to anthropogenic influences. Overgrazing and to a lesser extent drought in the 1930s transformed parts of the Great Plains in the United States into the “Dust Bowl“. During that time, a considerable fraction of the plains population abandoned their homes to escape the unproductive lands. Improved agricultural and water management have prevented a disaster of the earlier magnitude from recurring, but desertification presently affects tens of millions of people with primary occurrence in the lesser developed countries. Desertification is widespread in many areas of the People’s Republic of China. The populations of rural areas have increased since 1949 for economical reasons as more people have settled there. While there has been an increase in livestock, the land available for grazing has decreased. Also the importing of European cattle such as Friesian and Simmental, which have higher food intakes, has made things worse. Human overpopulation is leading to destruction of tropical wet forests and tropical dry forests, due to widening practices of slash-and-burn and other methods of subsistence farming necessitated by famines in lesser developed countries. A sequel to the deforestation is typically large scale erosion, loss of soil nutrients and sometimes total desertification. Examples of this extreme outcome can be seen on Madagascar‘s central highland plateau, where about seven percent of the country’s total land mass has become barren, sterile land. Overgrazing has made the Rio Puerco Basin of central New Mexico one of the most eroded river basins of the western United States and has increased the high sediment content of the river. Overgrazing is also contributing to desertification in some parts of Chile, Ethiopia, Morocco and other countries. Overgrazing is also an issue with some regions of South Africa such as the Waterberg Massif, although restoration of native habitat and game has been pursued vigorously since about 1980. Another example of desertification occurring is in the Sahel. The chief cause of desertification in the Sahel is slash-and-burn farming practised by an expanding human population. The Sahara is expanding south at a rate of up to 48 kilometres per year. Ghana and Nigeria currently experience desertification; in the latter, desertification overtakes about 1,355 square miles (3,510 km2) of land per year. The Central Asian countries, Kazakhstan, Kyrgyzstan, Mongolia, Tajikistan, Turkmenistan, and Uzbekistan, are also affected. More than 80% of Afghanistan‘s and Pakistan‘s land could be subject to soil erosion and desertification. 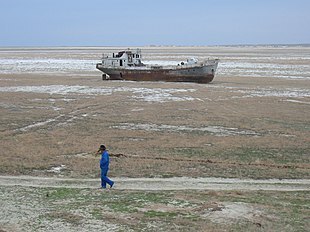 In Kazakhstan, nearly half of the cropland has been abandoned since 1980. In Iran, sand storms were said to have buried 124 villages in Sistan and Baluchestan Province in 2002, and they had to be abandoned. In Latin America, Mexico and Brazil are affected by desertification. Trees are planted instead of sand fences to reduce sand accumulating in a UAE highway. Desertification has been recognized as a major threat to biodiversity. Numerous countries have developed Biodiversity Action Plans to counter its effects, particularly in relation to the protection of endangered flora and fauna. A number of methods have been tried in order to reduce the rate of desertification and regain lost land; however, most measures treat symptoms of sand movement and do not address the root causes of land modification such as overgrazing, unsustainable farming (eg cattle farming) and deforestation. In developing countries under threat of desertification, many local people use trees for firewood and cooking which has increased the problem of land degradation and often even increased their poverty. In order to gain further supplies of fuel the local population add more pressure to the depleted forests; adding to the desertification process. Techniques focus on two aspects: provisioning of water (eg by wells and energy intensive systems involving water pipes or over long distances) and fixating and hyper-fertilising soil. Fixating the soil is often done through the use of shelter belts, woodlots and windbreaks. Windbreaks are made from trees and bushes and are used to reduce soil erosion and evapotranspiration. They were widely encouraged by development agencies from the middle of the 1980s in the Sahel area of Africa. Another approach is the spraying of petroleum or nano clay over semi-arid cropland. This is often done in areas where either petroleum or nano clay is easily and cheaply obtainable (eg Iran). In both cases, the application of the material coats seedlings to prevent moisture loss and stop them being blown away. Some soils (eg clay soils), due to lack of water can become consolidated rather than become too loose (as in the case of sandy soils). Some techniques as zaï or tillage are then used to still allow the planting of crops. The enriching of the soil and the restoration of its fertility is often done by a plants. Of these, the Leguminous plants which extract nitrogen from the air and fixes it in the soil, and food crops/trees as grains, barley, beans and dates are the most important. When housing is foreseen in or near the reforestation area, organic waste material (eg hazelnut shells, bamboo, chicken manure, …) can be made into biochar or Terra preta nova by a pyrolysis unit. This substance may be used to enrich planting spaces for high-demanding crops. In order to solve the problem of cutting trees for personal energy requirements, solutions as Solar ovens and efficient wood burning cook stoves are being advocated as a means to relieving some of this pressure upon the environment; however, these techniques are generally prohibitively expense in the very regions where they are needed. While desertification has received some publicity by the news media, most people are unaware of the extent of environmental degradation of productive lands and the expansion of deserts. In 1988 Ridley Nelson pointed out that desertification is a subtle and complex process of deterioration. At the local level, individuals and governments can temporarily forestall desertification. Sand fences are used throughout the Middle East and the US, in the same way snow fences are used in the north. Placement of straw grids, each up to a square meter in area, will also decrease the surface wind velocity. Shrubs and trees planted within the grids are protected by the straw until they take root. However, some studies suggest that planting of trees depletes water supplies in the area. In areas where some water is available for irrigation, shrubs planted on the lower one-third of a dune’s windward side will stabilize the dune. This vegetation decreases the wind velocity near the base of the dune and prevents much of the sand from moving. Higher velocity winds at the top of the dune level it off and trees can be planted atop these flattened surfaces. Oases and farmlands in windy regions are often protected by the approach described above by planting tree fences or grass belts in order to reduce erosion and walking dunes. Also, small projects as oases often section their plot of land by placing a barrier of thorny bushes or other obstacles to keep grazing animals away from the food crops. Instead, they provide water provisioning (eg from a well, …) outside this barrier. They provide this service mainly to accommodate the animals of travelers (eg camels, …). Sand that manages to pass through the grass belts can be caught in strips of trees planted as wind breaks 50 to 100 meters apart adjacent to the belts. Small plots of trees may also be scattered inside oases to stabilize the area. On a much larger scale, a “Green Wall of China“, which will eventually stretch more than 5,700 kilometers in length, nearly as long as the Great Wall of China, is being planted in north-eastern China to protect “sandy lands” – deserts created by human activity. There is another technique, which is controversial, that involves using livestock to rehabilitate land. This is based on the fact that many areas in the world which are heavily desertified were once grasslands and similar environments (the Sahara, areas in the USA that were affected by the Dust Bowl years) and where substantial populations of large herbivores were once supported. By using livestock (which is contained within a portable fence so that they cannot wander away from the site) along with hay and seeds contained within, the land can be restored effectively, even on mine dumps. In addition, people that hold livestock and that have a semi-nomadic livestyle (moving between fixed homes) such as nomadic pastoralists have significant interest in combating desertification of these areas. Having these people to plant shelterbelts, windbreaks, trees or nitrogen-fixating crops in the vicinity of their homes would also help a lot. Sand fences can be used to control drifting of soil and sand and soil erosion. These approaches are of widespread applicability, since the relative costs of pumping large quantities of seawater inland are low. Another related concept is ADRECS – a system for rapidly delivering soil stabilisation and re forestation techniques coupled with renewable energy generation. Numerous authors underline the strong link between desertification and poverty. The proportion of poor people among populations is noticeably higher in dryland zones, especially among rural populations. This situation increases yet further as a function of land degradation because of the reduction in productivity, the precariousness of living conditions and difficulty of access to resources and opportunities. Decision-makers are highly reticent about investing in arid zones with low potential. This absence of investment contributes to the marginalisation of these zones.When unfavourable agro-climatic conditions are combined with an absence of infrastructure and access to markets, as well as poorly-adapted production techniques and an underfed and undereducated population, most such zones are excluded from development. ^ a b Cornet A., 2002. Desertification and its relationship to the environment and development: a problem that affects us all. In: Ministère des Affaires étrangères/adpf, Johannesburg. World Summit on Sustainable Development. 2002. What is at stake? The contribution of scientists to the debate: 91-125..
^ “Ghana: Threats of Desertification Must Be Taken Seriously”, Public Agenda (allAfrica.com), May 21, 2007. ^ Lester R. Brown, “The Earth Is Shrinking: Advancing Deserts and Rising Seas Squeezing Civilization”, Earth Policy Institute, November 15, 2006. ^ Dobie, Ph. 2001.“Poverty and the drylands,” in Global Drylands Imperative, Challenge paper, Undp, Nairobi (Kenya) 16 p.
Bell, Trudy; Phillips, Tony, Dr. (December 6, 2002). “City-swallowing Sand Dunes“. NASA. http://exploration.nasa.gov/articles/06dec_dunes.html. Retrieved 2006-04-28. 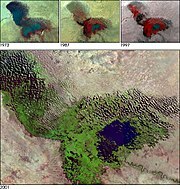 This article incorporates public domain material from the United States Government document “http://pubs.usgs.gov/gip/deserts/desertification/“. After years of Republicans, conservatives and business leaders using every form of propaganda to undermine the facts about global warming, here we are and whether it was opinion, rhetoric, politics or “framed” as something else – global warming and climate change are happening in the real world now. Climate change is not something we are helpless against. Too much attention is being focused on the Carbon cycles, and too little on the Water cycles. Worldwide, our fresh water supplies are overrun with weeds. Aquatic weeds more than quadruple evaporative losses on a body of water. They clog waterways with silt, and turn wetlands into drylands. Clearing the weeds and their silt is the way to restore health to our wetlands. Healthy wetlands are the key to healthy drylands. Human use of water supplies must be limited, but let’s share less with weeds. That would certainly help and is a really good point but are they taking a portion of the carbon dioxide and converting it to oxygen? Wonder if those weeds and the silt around them could be packaged into something to cover areas that are growing into deserts to reclaim them? Just thinking . . . Thanks for your comment – very helpful and good insight. Definitely gets me thinking about it differently.